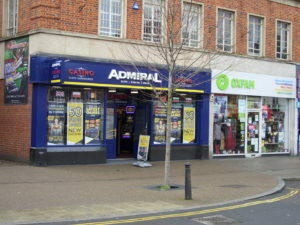 Admiral Casino, Oxford Street, High Wycombe. A 10 month old baby was injured during an incident in Frogmoor, High Wycombe. On Friday 1st February 2019, at around 7.15pm, two men and two women with a 10 month old baby were walking past the Admiral Casino, Oxford Street (at the lower end of Frogmoor near to Bull Lane) when a group of four men threw snowballs at them. One of the snowballs hit the baby on the cheek causing it to redden and swell. An argument subsequently broke out between the two groups over the throwing of the snowballs. The offenders, all described as Asian men, then spat at the victims. One of the offenders was of a chubby build with short, dark hair. He wearing dark trousers, a green hooded top with white stripes down the side and white shoes. The other offenders were described as wearing tracksuits with dark jackets. Investigating officer PC Dominic Crayden, of the Investigation Hub based at High Wycombe police station, said: ‘This was an unprovoked attack and we would urge anyone with information to please come forward. If anyone has any information which could assist with the investigation, please call the non-emergency line 101, quoting reference ‘43190034303’ or make a report online.